A review in 10 words (or thereabouts): A city on fire, a damsel in distress, and a young boy with an ancient power. 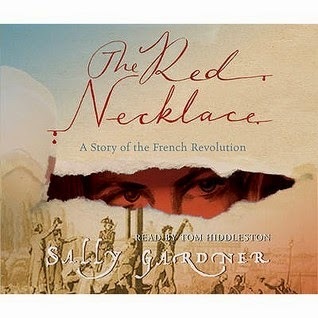 Did you notice that Tom Hiddleston narrates the audiobook? That's why I picked up this particular title. It's no secret that I adore a British accent for audiobook readers, and, well, Mr. Hiddleston is SUPER easy on the ears. Sure, I got a little distracted at times imagining Loki reading me a book, but that aside, it was a very enjoyable audiobook experience. I tend to shy away from audiobooks because I like to see how things are spelled, especially names, and there are some pretty interesting names in this particular tale. Is that weird? Anyway, Sido is the Marquess's daughter. The Marquess is this crazy selfish dude who wants nothing to do with his daughter, and chooses, instead, to rack up tons of debt. In order to get out of his current financial predicament, he sells Sido to the Count Kalliovski, promising him her hand in marriage. Then there's Yann, a gypsy orphan who finds himself in the wrong place at the wrong time. He's travelling with a small band of magicians when the group of is invited to the Marquess's house for a command performance. Unfortunately the Count is a man of many secrets and the head magician knows all about his dark past. Now Yann is on the run from the Count, the Count is aligning the stars to destroy the Marquess, and the city of Paris is on fire with a revolution. There's a little bit magic and a little bit historical fiction in this fast paced tale. Sido is a fighter. She's loyal t a fault, but full of pep. The Count is pretty creepy. I envision him as Rasputin in the animated Anastasia...perhaps it's the accent that Hiddleston game him :) And then there's Yann, the survivor. He has a sad story, and after only a brief moment of angst and idiocy, he comes to his senses and takes advantage of a pretty sweet situation. Gypsy magic is pretty cool, so if you like gypsies or magic, give this a try :) Then there's the element of revolution. Gardner paint a pretty terrible picture of a frivolous aristocratic class and an equally tense picture of the citizens. So if historical fiction is your thing this might also be the book for you. If want the thrill of a supervillain reading you a book, I suggest the audio, it's a good time.